We developed a family of interactive objects integrating dynamic sound feedback, called Stonic. They are designed to provide users with different affordances, i.e. 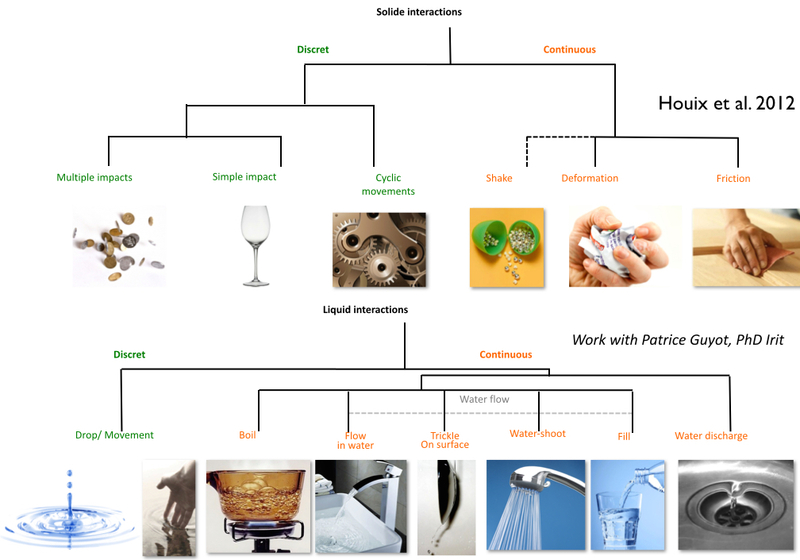 action possibilities, which are linked to different sound feedbacks. 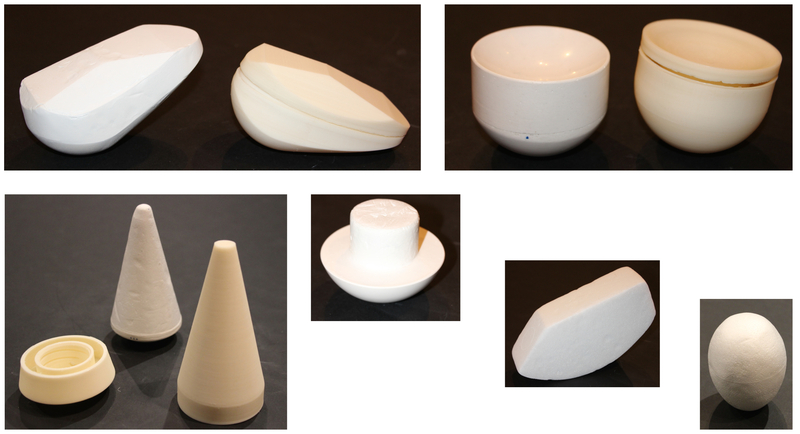 These objects are used for experimental studies to better understand and model augmented auditory feedback in object manipulations. Solid and liquid interactions producing sounds, from Houix et al. 2012 and Guyot P et al. 2O14. We used the taxonomy of basic physical interactions, (discrete, like impacts, & multiple impacts, or continuous like tearing, shaking, rubbing, …) to define a lexicon of basic gestural interactions. We also looked at the different taxonomies on how people grasp objects to study the relationships between the shape and the type of grasping (for example precision vs power grasping). First prototype and the different gestural interactions (Left). Different embedded sensors (Right). 3D modeled by Arnaud Ouin (Beaux Arts du Mans). 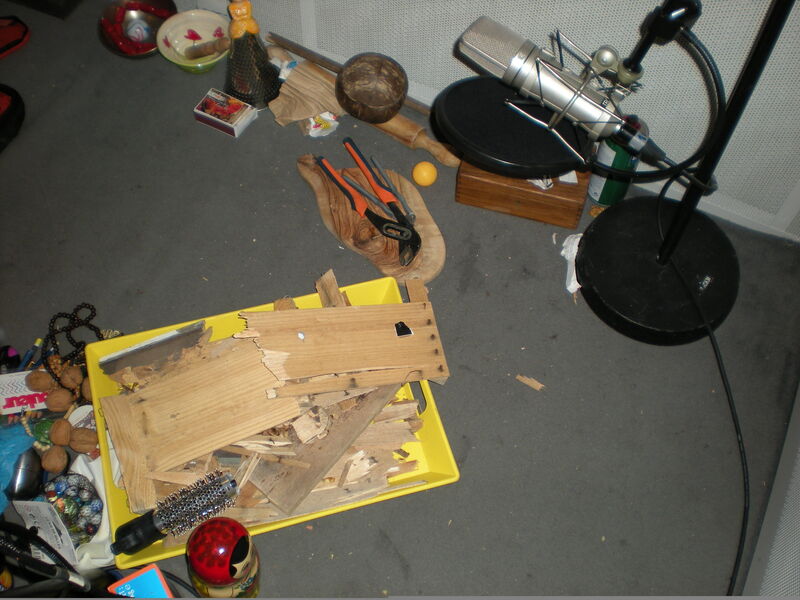 The different interactions producing sounds are the basis of our requirements for the object creation, because in our case we are interested in manipulations of objects that are related to the production of sounds. We developed a first prototype. The object is instrumented with different sensors and the data is processed in order to recognized the different actions. The different actions are sonified with recorded sounds played interactively with MUBU framework. Julien Groboz, independent designer, created different 26 shapes meeting our specifications. Formal propositions by Julien Groboz. Scale 1, made with acrylic resin and / or Polysterene and their 3D print. Object(s) should allow: manual or bimanual gestural interactions; with or without contact with a surface; precision or power grasping and different elementary interactions: to hit, to rub, to turn, to swing, to tilt, to place, to shake, to press, to crush. All the information about the different sensors were provided. We selected 6 forms to test their affordances and Julien Groboz modeled the objects for 3D printing. Fabien Bourlier created two sets of different sonic affordances. A first one corresponds to concrete sounds related to physical interactions and a second one more abstract keeping morphological aspects of the physical interactions producing sounds. The different created sounds will be dynamically and interactively played using MUBU. Recording session. (c) Fabien Bourlier. Different physical materials were used in order to embodied the object with two contrasted materials: wood that evokes the warmth and the intimacy; metal / glass with an evocation more colder et less resonant. Several interactions producing rich timbre were tested and recorded: breaking, twisting, trampling on, throwing, hitting, rolling, …. A second set two family of abstract sounds have been created. The first one is based on an organic metaphor, but without identification, that produces rich timbres by contrast with “aerial” sounds with more noisy and uncluttered timbres. New videos with sound design will be online soon.